On 22 November, the NSW Liberal Government passed new laws designed to fast track children from the “out of home care” system into forced adoptions. The laws will have a devastating effect on families separated by Family and Community Services (FACS), particularly on Aboriginal children who are almost 40 per cent of the foster care cohort in NSW. The Child Protection system punishes poor and black people for the social misery created by capitalism. Rather than provide resources to deal with the crises around homelessness, unemployment, mental health, addiction or family violence issues, children are forcibly removed from their families, mostly due to allegations of “neglect”. As the Royal Commission into institutional child sexual abuse recently confirmed, the abuse of children remains rife within “out of home care” itself. These new laws are designed both to make it harder for children to ever be returned to their families and to reduce the costs on the state of maintaining children in “care”. Currently, parents seeking to be reunited with their children can bring an application to court, demonstrating that child protection concerns have been addressed. Under these news laws, an application may not even be heard if the Department can show the child is in a “stable” placement. Most concerning are new provisions that make it possible for a “Guardian”, a long term carer appointed by the Children’s Court, to adopt the child without their parents’ consent. This would permanently sever any legal relationship with their birth family. Also in late November, a Federal Senate Committee considering adoption reform recommended similar legislation be rolled out across Australia. The new laws were introduced without warning, with less than three sitting weeks left of the NSW Parliament. 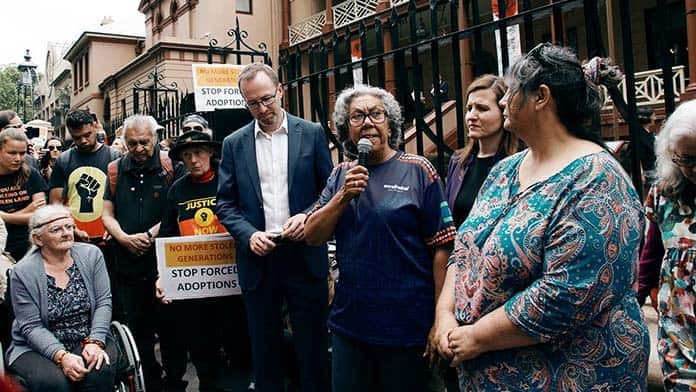 Greens MP David Shoebridge and Labor Shadow Minister for Child Protection Tania Mihailuk immediately convened a meeting of Community Legal Centres, Aboriginal organisations and other social services concerned about the impact of the changes. This coalition put up an impressive fight. An open letter denouncing the legislation for “repeating the mistakes of the past” was signed by more than 80 organisations. In recent years, Aboriginal rights campaigners have been arguing that the practices of the Stolen Generations are being continued today through the operations of Child Protection. Protests have often been led by affected families themselves, particularly “Grandmothers Against Removals” (GMAR) groups. The number of Aboriginal children in “out of home care” has more than doubled since Kevin Rudd’s Apology in 2008, with over 18,000 children now in care Australia wide. Despite an “Aboriginal child placement principle” mandated in every state, only a minority of these children are actually placed with their Aboriginal family. During the campaign against forced adoptions, the arguments made by GMAR about the racism of the current system broke through into the mainstream. A full page advertisement in the Sydney Morning Herald by peak Aboriginal welfare body Absec demanded the NSW Government “stop removing Aboriginal kids from their communities”. Most significant was the strident opposition of the Labor Party to the legislation, on the basis that it would make an already punitive system far worse. Federal Labor MPs on the Senate Committee also issued a dissenting report, saying forced adoptions would continue, “Australia’s reprehensible legacy of permanently removing First Nations children from their families”. Three demonstrations were organised outside NSW Parliament, all of them attended by ALP representatives. Inside the Parliament, Labor and Greens politicians co-operated to filibuster right through until late on the final sitting night. Shamefully, Greens spokesperson on Aboriginal Affairs Dawn Walker, and other upper house members of the right-wing Greens faction, said nothing against the laws. Labor Shadow Aboriginal Affairs Minister David Harris spoke about the shock he experienced when he learned that babies are currently being removed from hospitals straight after birth. He explained that Aboriginal women often avoid the health care system entirely when pregnant due to their fears of Child Protection. Tania Mihailuk gave an epic speech that lasted more than six hours, which praised the rallies and committed Labor to repeal the legislation if elected next March. Also significant was the participation of unions, particularly the PSA and ASU who represent Child Protection and community sector workers. In Western Sydney, a snap meeting of Aboriginal workers from different organisations called a rally targeting Liberal MP Stuart Ayers in Penrith. Along with Aboriginal people and ASU members, the CFMEU brought building workers from a local site. Some Community Legal Centres and Aboriginal services stopped work for the rallies. These efforts gave a glimpse of the kind of power that can build through an ongoing campaign, ensure these laws are repealed, and press on to radically transform the Child Protection system. Racism in white Government continues as the can’t shoot them they try to destroy by assimilation and psychological war.